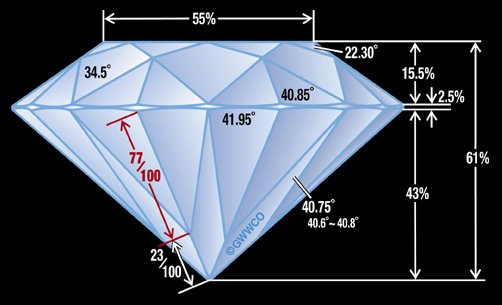 After the diamond cutter’s top and bottom angles have been established he must address the important factors in creating the eight hearts and eight arrows. As discussed in the DNA of H&A section, many facets are involved in creating an acceptable H&A pattern. Below we reveal the “Coke Secret” for the Hearts and Arrows Ideal Cut. This template was adapted from early research conducted by GIA Japan in the early 90s. Below we illustrate how each heart is created primarily from two pavilion main facets. The green pavilion main facet shown at seven o'clock is reflected twice to create one half of two separate hearts (green) on the opposite side of the stone. While the yellow pavilion main facet shown at five o'clock is also reflected twice to create one half of two separate hearts (yellow) on the opposing side. The completed single heart shown at 12 o'clock is then a combination of two well-formed pavilion main facets. It is imperative that all the facets are exactly the same length and shape or the resultant hearts would be deformed and asymmetrical. We show examples of this in our Grading The Hearts and Arrows section. The two reflected the pavilion main facets creating the heart are then further shaped into a more proper shape by the combination of table and star facets, which blunt the shoulders or lobes and make them more resemble hearts. Though not as complex as the heart pattern, the creation of arrows is no small task. As shown on the left image below, each pavilion main facet (shown in face down view) when inverted becomes visible as both the "shaft” part of one arrow (A) directly below and is also reflected 180° to produce the arrowhead part (B) of a second arrows figure. The right image below shows that each main facet is visible looking directly down through the stone (in face up position) as the shaft part of one arrow. 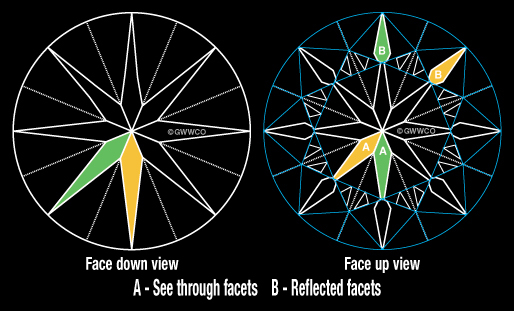 These are known as “see through facets” (A). The same pavilion main facet is also reflected 180 degrees (B) and becomes the arrowhead of the opposing arrow figure. Each arrowhead is then a “reflected facet”. Each arrow then is composed of a see-through facet (shaft) and a reflected facet (arrowhead) from two separate pavilion mains. Therefore, it takes 16 total reflections to create a complete set of eight arrows.